Background: Black carrot (Daucus carota ssp. sativus var. Atrorubens Alef.) has fetched increased interest in the recent years, primarily due to its colour, therapeutic and nutritional properties. Black carrot has high nutraceutical potential and is rich in anthocyanins and flavonols with antioxidant activity is four times higher than red carrots. Several studies have focused on the product development from black carrot to preserve its nutritional values in different forms. In this study, attempt had been made to develop noodles incorporated with black carrot powder. Results: Various treatments were analysed for its functional, physical, cooking and sensory properties as responses for the optimization. The antioxidant activity, total flavonoid content and anthocyanin content significantly increased (p<0.05) with increased incorporation of black carrot powder in the noodles. However, being heat labile, the anthocyanin content of the cooked black carrot noodles decreased significantly (p<0.05). The Water Absorption Capacity (WAC) increased from 190.6 ± 4.93% (control sample) to 241.3 ± 5.68% (20% incorporation). The Oil Absorption Capacity (OAC) rather remained constant. Although the cooking time decreased with increased incorporation of black carrot in noodles, the cooking loss also increased making it unacceptable. 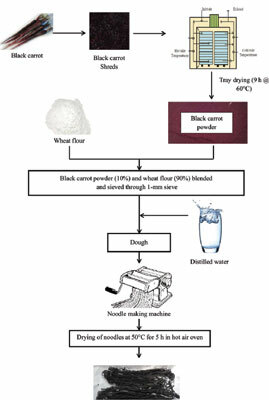 Conclusion: The result of this study revealed that 10% black carrot powder incorporation was optimal for black carrot fortified noodles production based on functional, physical cooking and sensory properties. The anthocyanin, flavonoid and antioxidant activities of the optimum formulation in raw and cooked noodles were 14.94 ± 0.021 and 7.94 ± 0.074 mg/100g, 30.06 ± 0.188 and 20.10 ± 0.141 mg/100g and 35.47 ± 0.15 and 16.55 ± 0.18 % inhibition, respectively. Anthocyanin, black carrot, cooking properties, flavonoid, functional properties, noodles.